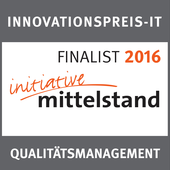 We are happy and proud to announce that savvytest has been voted one of the best three solutions in the quality management category of the renowned Innovationspreis-IT 2016 (Innovation Award IT 2016). The jury valued the innovative potential of our solution, helping our customers to improve and accelerate in software development. If you want to make sure that your enterprise developers are enabled to deliver at the high quality management level provided by savvytest, act now and contact us for a free evaluation of our new savvytest 3.0 release! In addition to that, installation of savvytest 3.0 is easier than ever. So do not hesitate to accelerate quality now! Learn more on the unique savvytest approach or just ask us for a trial!